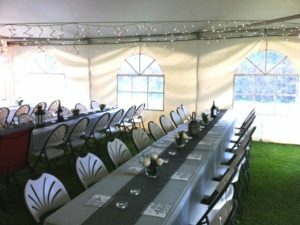 In addition to party tents, Lauzon Tent Rentals also provides chair and table rentals for virtually any event. When placing your tent rental order with us, simply specify how many chairs and tables you will need for your event, and what kind. To see how many people can be seated under each of our tents, click here. If you’re unsure of the number of tables you need, contact us here or give us a call at 613-330-6060. Click here to view photos of our chairs. Click here to view photos of our tables.